Those Pacific Golden Plover sure do make their way around the world, don't they? Nice post and photos Mick! I can see your dilemma Mick. I imagine a scope might come in handy for that task. Great shots of the roost and the birds. 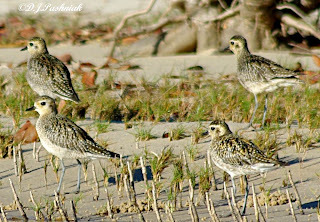 The blue legs on the Pacific Golden Plovers sure stand out don't they? Beautiful! Thanks Birding is Fun. I am always amazed at the distances all the shorebirds fly to get here. Hi Larry, it's not possible to put up a scope - the water is too deep and the birds would be off long before I could get it set up. They react to any noise which is not usual to their environment. I have to open the clasps on the camera case well out from the shoreline and then sit still and let the tide drift me in and along past the roost. You have so many of them. I envy you. I have to go across half of Sweden in summertime to see any waders at all. And I like them. Great shots. 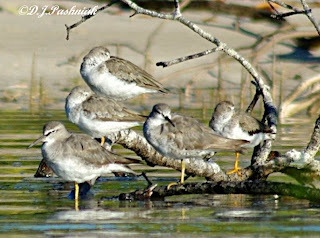 Thanks NatureFootstep - The Great Sandy Strait is a Ramsar listed wetland so we should see lots of waders in this area. 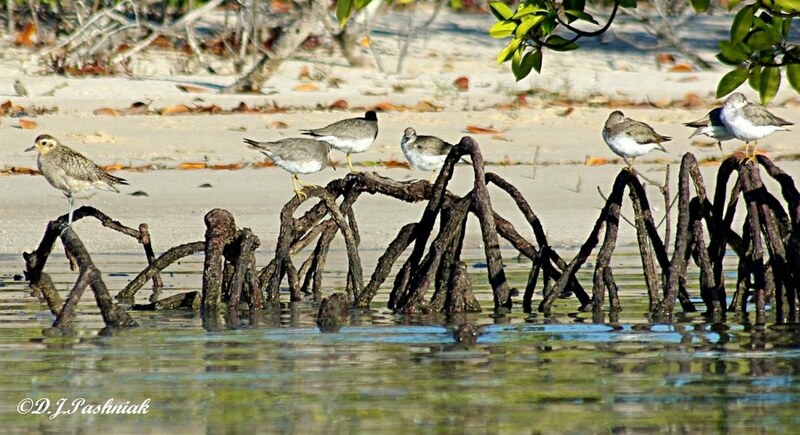 I agree it is unusual that your Golden Plover has parked on the Mangrove roots. I find it fascinating that birding/blogging/kayakers can find eachother via the Internet. I went Orchid hunting on the weekend and remembered to take several "habitat" shots - for you. Great ID assistance; thanks for sharing your knowledge Mick. I have,in the past, seen all these species on sand banks on the lower reaches of the Daintree River but it took me ages to try and identify them! 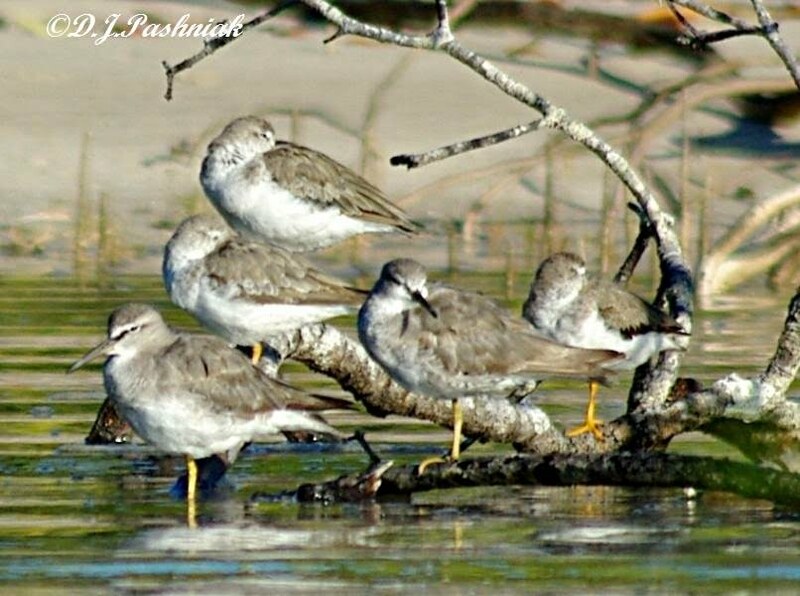 And I've never seen these birds roosting - the only way I could identify the Terek Sandpipers was from the slightly upturned bill and that manic feeding habit they have. I think I'll make some extra notes in my bird book now. 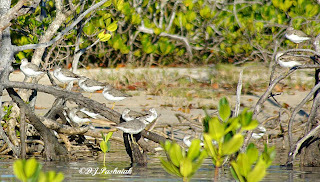 Hi Denis, I wonder if shorebirds learn from other shorebirds or if that is too fanciful? Last year there was only one Pacific Golden Plover on that site that associated with the other tree roosting birds. So could it be learned behavior? I look forward to your next post about orchids and the habitat shots as well! Thanks Barbara. It took me ages - and photos taken over some months - to sort out what I was seeing in that tree roost. I find it interesting that two such similar looking species 'hang out' together. btw - I don't think I have ever seen Terek Sandpipers feeding out on the sand flats! 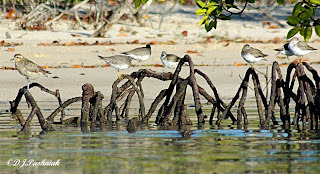 ...what a beautiful photo of the birds all resting on the roots. I really like those blue legs, too...another bird I've never seen.